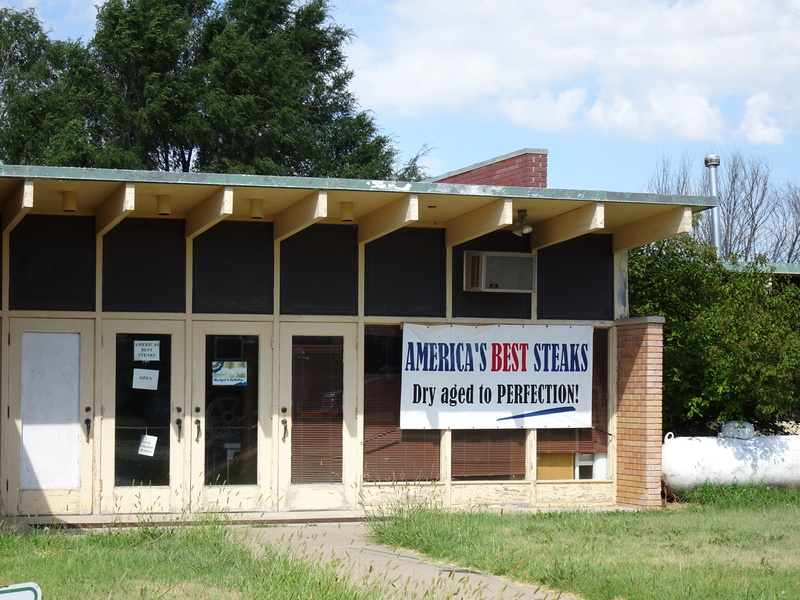 I had been wanting to return to a little town where I happened across a closed school that was advertising “America’s Best Steaks”. I stopped and being a “beef connoisseur” I only purchased a couple of pounds of hamburger and two filets. They were amazing! I knew I would be making a trip back. Bogue, KS is 137 miles from home, so there is a lot to see on the way. I found Paradise!! Now if I could only locate the Fountain of Youth! Built in 1938 the limestone water tower is a historic Works Progress Administration project. This area of Kansas grows a lot of corn. Beautiful barn, I haven’t noticed many with hay hooks hanging. 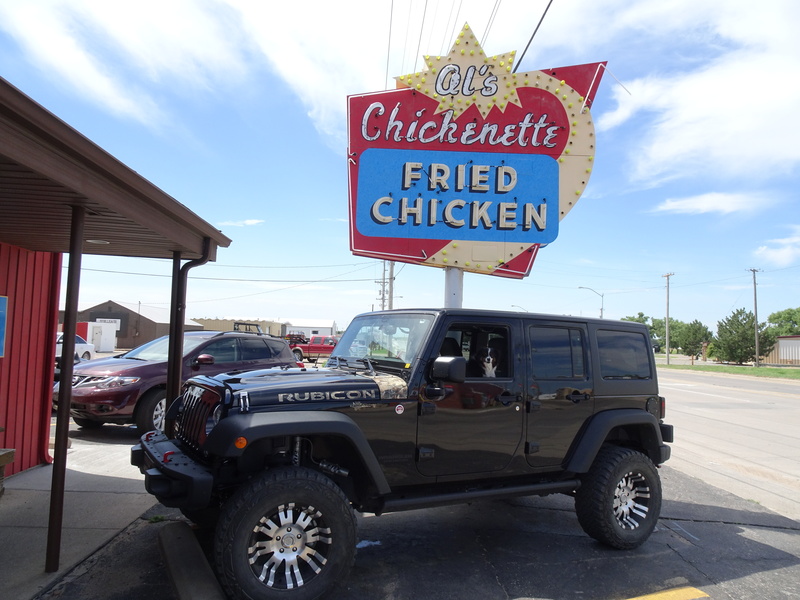 Couldn’t resist a stop at Al’s Chickenette in Hays on the way home. The restaurant opened in 1949. Wylie is waiting patiently (not really) for a bite a chicken. Here’s a link to their website. 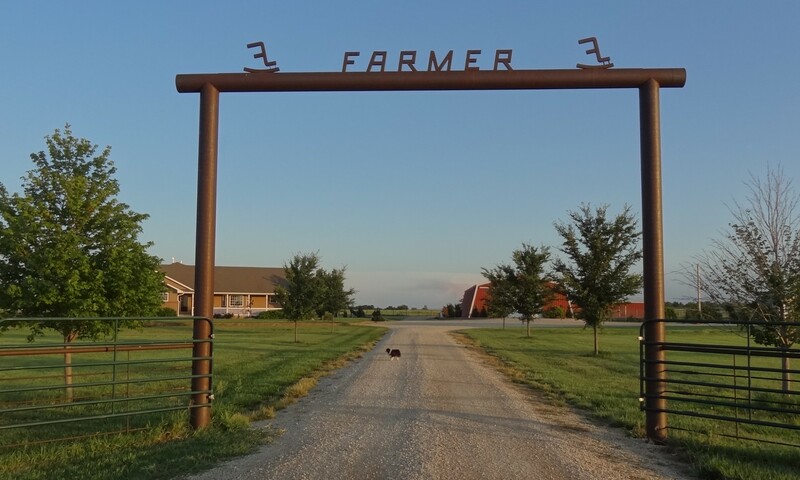 This entry was posted in Day Trips and tagged Barns, Kansas, small towns on August 18, 2017 by Debra Farmer. What wonderful photos! I love the art deco-style silo especially — and this time, I didn’t confuse Riley with a cat! 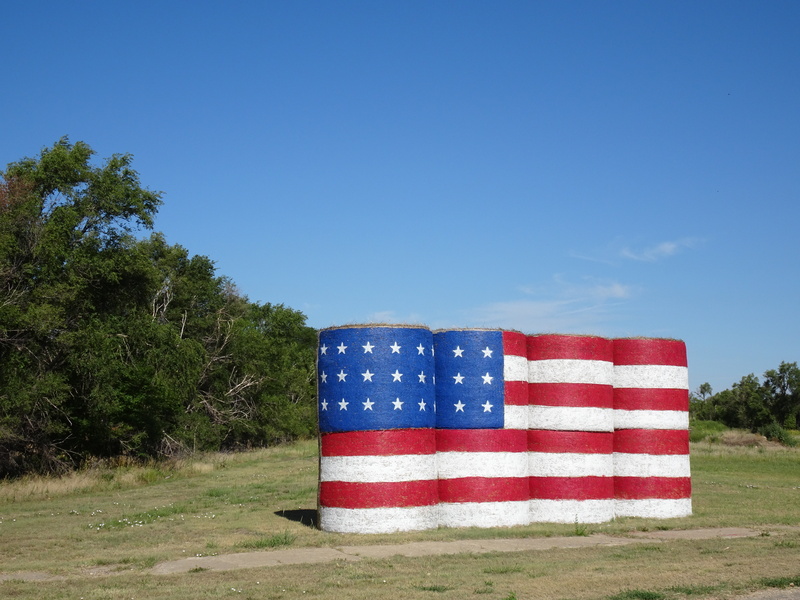 The hay bale flag is great, too. I’ve seen them made into turkeys at Thanksgiving and such, but this is a new one, and it’s so well done. As for those steaks, I certainly was tempted when I looked at their page. When I was growing up in Iowa, we always bought a side of beef (usually a half), had it hung at the locker for a time, and then custom cut. It was so good, and I’ve always wished I could find a real meat market down here that would do the same. In the 1970s, there was one in Houston, but I think they’re gone. No one has the time for such things any more — although, if they got a taste, they’d be clamoring for it. The silo is a water tower, the most unique one I’ve ever seen. I couldn’t believe the work they but into crafting the door frame! There are so many butcher shops still operating in these parts. Some of the little towns that’s the only business still open! They often have deer, elk and buffalo too. Out of all my purchases at local markets, this one at Bogue is my favorite. Wylie is happy not to be confused with a cat, can’t wait for you to meet him!